What are the Odds? : Does it Get Better than This? This will be really rough. Hopefully, when I get back, I will be able to sit down and do justice to it all. And you are missing the pictures... which truth be told Amy's camera is ten times better than mine so the wait for her pictures will be worth it. We had a lazy start to the day Amy was recovering from finishing working night shifts and I recovering from our ride in. The morning was filled with butterflies and so many different kinds of beautiful birds. Everyone here is really friendly and I love the staff here. I will have an excellent memory to associate with the name Diego now. Our tour only had 6 people to fly through the canopy with. Ulises our guide said there was 60 the day before. So glad I didn't have to wait for 60 people. Our ATV ride was actually a tracker pulling us behind but we didn't mind... we were in the rain forest and it is beautiful. 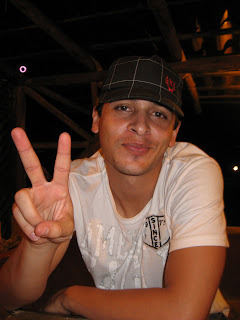 I personally liked Ulises best, he was cute as can be, kind, fun, and had an obvious responsible side to him. Me and responsiblity... Amy and I are so opposite. 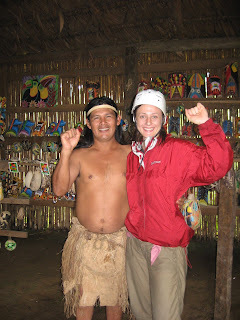 For example... after our instruction period for safety etc Ulises asked what our job was. I replied to not manipulate the equipment because that is what he had just stressed. Amy said... to enjoy/have fun! Which I think was the answer he was looking for. And that about sums us all up. okay back to the rain forest. 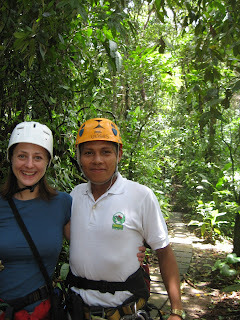 Loved our hike through the forest to get to the beginning of the canopy zip line. Amy liked the pick up line from Caler. 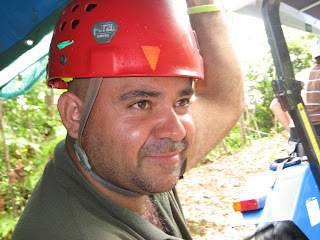 I sadly won't be with you on your canopy tour but it would be my honor to help you into your harness and gear. Which was promptly met by Amy's I bet you would. That is what led to the whole proposal. And then the zip line... of course it started to rain right before our first zip. A big thank you and kudos to Nate Walsh. The recommendation/mockery that encouraged me to buy my Marmot rain jacket fabulous. It poured on us and while everyone else, including the guides, were soaked through and freezing with goose bumps, for the first time ever I wasn't. And the Keen sandals... the poor family with us had tennis shoes and socks on... how miserable... wet shoes and socks. I haven't thought once about my feet, Keens work for everything. One shoe fits all!! Besides the rain stinging and sometimes maring our view as we flew through the rain forest I was enamored by the rain. I mean we are in the rain forest... it was perfect. And the view, I don't have the words for it. At one point we are at least 4 stories high in the air, all around is jungle and when you look down and see the leaves as big as you are and a waterfall and small river rushing over rocks through openings of the trees... and you are flying through the air... wind in the face... cute Ticos taking care of you... really the only bad part was how bad I was at slowing myself down causing a slighty swollen pinky and bruised knee from 2 impactful endings. There were 8 different zip lines in total. The rain lasted for 1/2 or 2/3 of the time during which we heard an excellent clap of thunder really close. Only to discover from our guides it was the volcano! Can it get any better. The constant smoke pouring out the top really is a sight to behold. The horses were waiting for us at the end to take us to the traditional village... Capi Capi! How awkward was that? To great you make a fist with your right hand and tap it on the left shoulder of whom you are greeting and say capi capi. They are for real, the chief was there, but it is a guilt you to buy our crafts stop. But I learned that the juguar is a symbol for intelligence, Tucan for feminine beauty, macaw for true love and fidelity, and the butterfly for love and peace. I got my horse to run for just a second on the way back, mostly it trotted when I tried to go faster and walked at any chance. Lazy tourist horse. Fun nonetheless. And then it was all over. Time to say good bye to our Tico friends and go back to the hostel. 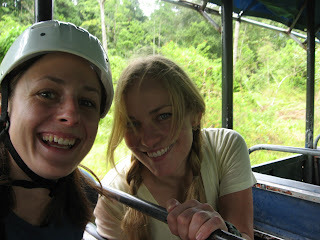 So tomorrow we are going to catholic church at 9am, then horseback ride to the La fortuna waterfall and swim. 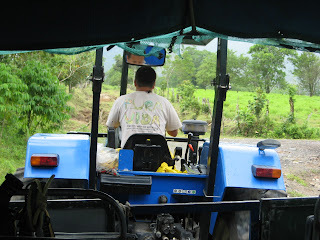 Then as soon as we get back it is to Tabacon hot springs and volcano tour! I really hope it is clear so we can see the red glowing lava flowing down the mountain. The lava flow changes directions and it is on the opposite side of the mountain from where we are facing. But tonight, tonight is dancing! We are going to the discoteque. We are recuiting some people from the hostel to go with us and the receptionist is now our friend and she is coming too. She is also coming with us to the waterfall. Nice to have a local around. And just maybe, we can talk the owner Diego to come. The receptionist said we will celebrate my birthday while we are there... she heard that part of this trip is the beginning festivities for my 30th. So all is well and then some. No ability to spell check and no time to read through so I apologize for more errs than usual. Um... why are you blogging? You're in Costa Rica! Stop staring at a computer and enjoy that rainforest. We can wait.